This homemade pumpkin pin is velvety smooth and no store bought pie can even come close to how amazing it is. 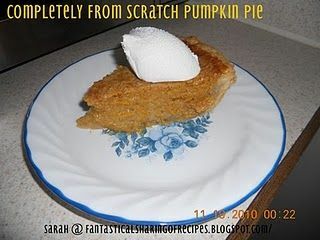 I decided for my second Thanksgiving to make pumpkin pie from scratch because I had seen sugar pumpkins at Walmart and researched what the heck that meant. I then discovered sugar pumpkins were for pumpkin pie and that was that. It wasn't too hard and the end result was the most incredible pumpkin pie I have ever eaten. The texture of fresh pie filling was so velvety smooth and melt-in-your-mouth that I don't think anything will ever top it. For the crust: Cut together flour, shortening and salt until it resembles peas. Combine the egg, water and vinegar in a separate bowl. Slowly add egg mixture to flour mixture. Stir just until moistened and a soft dough forms. Divide into 2 disks, wrap and refrigerate until ready to use. When ready, roll it out. For the pie filling: Cut one pie pumpkin in half, remove seeds. Try and get all the pulpy stuff out. Cover with foil. Repeat. Bake for 1 hour in a preheated 350 degree oven. Scoop out pumpkin and mash. Mix in sugar, cinnamon, nutmeg, cloves, condensed milk and eggs in with 1 1/2 cups mashed pumpkin until smooth. Pour into an unbaked 9-inch pie crust. Bake at 450 for 15 minutes, then lower heat to 325 and cook for another 45 minutes. Another one of my favorite holiday recipes is Sweet Potato Casserole and I'm not even that big on sweet potatoes! 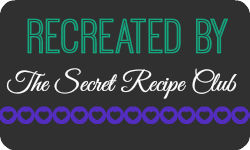 This recipe is my guilty holiday pleasure! Something Swanky shared this New York Times Pumpkin Cheesecake with Oreo Crust and pumpkin and Oreos just sounds like the most wonderful pair.